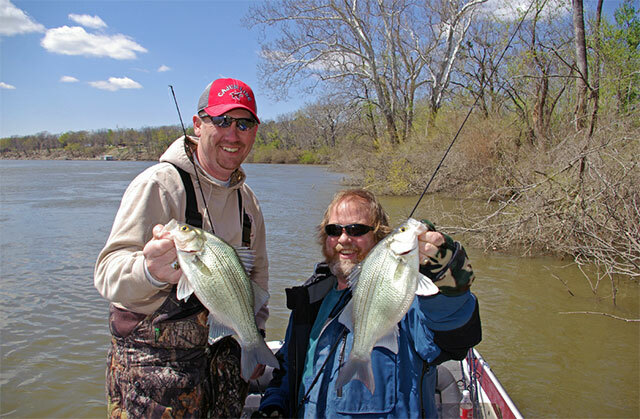 The white bass fishing on the Oklahoma’s Grand River was incredible on that fine spring day. My son Josh and I joined James Therrell of Tulsa for a day of angling at Choteau Bend on the upper end of Fort Gibson Lake near Wagoner, and James guided us to one of the most enjoyable days of fishing we’ve ever experienced. The morning started out unseasonably cold, with the temperature hovering around freezing. But as we soon learned, nothing warms you quicker than a fish at the end of your line. “Got one,” James said, just after making his first cast for the river’s spawning white bass. Beneath the surface of the fast-moving water, I could just make out the silvery form of a big white struggling against James’ line. Before James could boat his fish, however, another white nailed the jig Josh was retrieving across the stream bottom. “I’ve got one, too!” Josh exclaimed. At the same instant, I felt a hard thump on my lure. And almost as quick as we started fishing, we had a triple going. That was just the first of many two-man and three-man hookups we would enjoy that day. The white bass fought furiously, as white bass always do. But we brought them quickly to the boat, removed the hooks, tossed them in the live well and cast again. Sometimes we’d crank the reel handle a half a dozen times before we got a hit, but often the bass attacked as soon as the jig hit the water. These were good-size fish, too, running 1 to 3 pounds each. And on the light tackle we were fishing, they put up a battle all out of proportion to their size. The action went on cast after cast for around three hours. During that time, we put 50 bass in the live well and released at least as many more. That short period of chunking and winding encompassed some of the most fun fishing action I’ve experienced in a long time. To say I enjoyed myself would be an understatement. I was ecstatic. White bass, also known as sand bass or just “sandies,” inhabit portions of at least 30 states. Their original range encompassed river systems in the Mississippi and Ohio valleys and the Great Lakes, but today, due to widespread introductions, they are available throughout much of the central and eastern U.S. The 6-pound, 13-ounce world record, a true monster, was caught in Lake Orange, Virginia in 1989, and was tied by a same-size white caught in Louisiana’s Amite River in 2010. In spring, white bass seek tributaries of major rivers and reservoirs for spawning runs. It is during these runs, when thousands upon thousands of whites are concentrated in small creeks and rivers, that the vast majority of white bass are caught throughout their range. In fact, for some white bass aficionados, there is no season but spring. When the spawning runs end, so does the fishing. Timing of the spawning runs varies widely throughout the fish’s range, but checking water temperature can help you pinpoint this activity. When it hits 50 degrees, you’ll find schools of white bass gathering near mouths of feeder streams. At 58 degrees, the upstream surge begins. On some waters, the spawning run can last as long as a month, but typically, it starts and ends within the span of two weeks. White bass are a cinch to catch when they’re spawning, and many tactics can be used. Few could be any more effective, however, than the technique our trio used on Grand River. We were fishing with 6-foot, light-action Quantum Energy PT rods paired with Quantum Energy PTi-B spinning reels spooled with 4- to 6-pound mono. The lures we were casting were 2 1/2-inch Gene Larew Stroll’rs (a soft-plastic crappie lure body) on 1/4- to 1/2-ounce unpainted (silver) jig heads. The jigs were cast near brush and exposed roots along the river bank, then worked slowly across the bottom with a lift-drop retrieve. When James, Josh and I finished our day, we started transferring the 50 white bass we’d kept into my 48-quart cooler. I should have brought two coolers that size. The one I had wasn’t nearly big enough for that many fish, and we wound up giving 10 bass to a couple of other anglers who hadn’t enjoyed as much action as we did. The 20 bass I dressed when I got home produced enough fillets to fill three gallon freezer bags. That’s another thing I like about white bass—these linesides are good freezer-fillers because you can keep as many as the law allows (there’s no limit in Oklahoma) without hurting the fish population. And if you take time to remove all the dark-red flesh along the sides of the fillets, white bass are darn good eating. If you want to get in on some of this action yourself, better get out there quick because it won’t last long. The spawn is in full swing in many parts of the country right now, and for super-fast action on hard-fighting fish, the white bass run just can’t be beat.